Some people don't like beauty products that smell like food. My friend Susan, for example, thinks that products scented like vanilla or chocolate just smell too darn good and she'll get hungry using them in the shower. This beauty chick is not of that mindset at all. The more decadent and dessert-like it is, the more I want it in my shower. 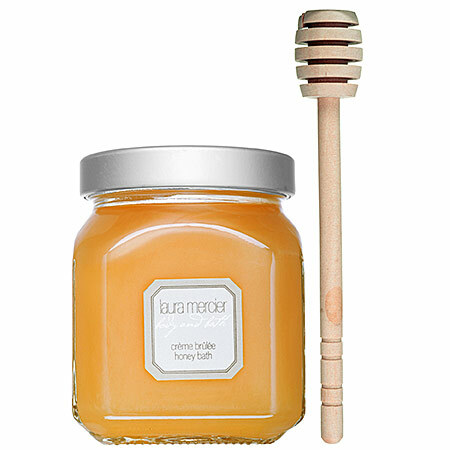 Laura Mercier Creme Brulee Honey Bath is one such product. I had been intrigued by this tub for months -- every time I saw it, whether I was at SpaceNK, Sephora or bluemercury, I simply had to unscrew the cap and take a deep, blissful breath. I'll be darned if it doesn't actually smell exactly like Creme Brulee -- its blend of caramel, cream, French vanilla beans and white musk create an aroma that is sweet, delicious and utterly scrumptious. Finally, I decided to bite the bullet and spend the $40 to get the tub -- made ever so much more adorable by the included wooden honey dripper. But rather than use this as a bubble bath, I decided to do something gutsy ... I lathered up with it as a body wash! I poured a generous amount on my pouf, worked it into a sudsy mess and went to work scouring every inch of my body with the deliciously-scented stuff. I have to say I was even more enthralled and enchanted than I expected to be! My shower smelled delectably mouth-watering without being cloying, and my skin became softer and smoother as I ran my honey-bath-soaked pouf over it. Now that I've introduced this tub into my life, I don't think I'll be able to live without it. If you want a little dessert in the morning, you simply must pick one up. Just think -- no calories! Laura Mercier Creme Brulee Honey Bath retails for $40 at sephora.com. Oh, and I hope you had an awesome time in LA! Sounds like everyone had a blast, though :D!! That stuff is so addictively delicious! Great to see you over the weekend! Sorry we didn't ahve more of a chance to catch up! I have yet to try or buy anything Laura Mercier...I know, its like a sin. This might be the perfect oppotunity to introduce myself to the brand. I love your blog!!! jennbee -- Believe me, it's hard to resist the temptation! :) LA was definitely fun. I'm not ready to be away from the sunny, warm weather! jet set girls -- Great to see you too! Hope to see you in NYC soon! virtuous blue -- Don't worry, just be sure to buy Laura Mercier from now on :) Thanks for the great comments!